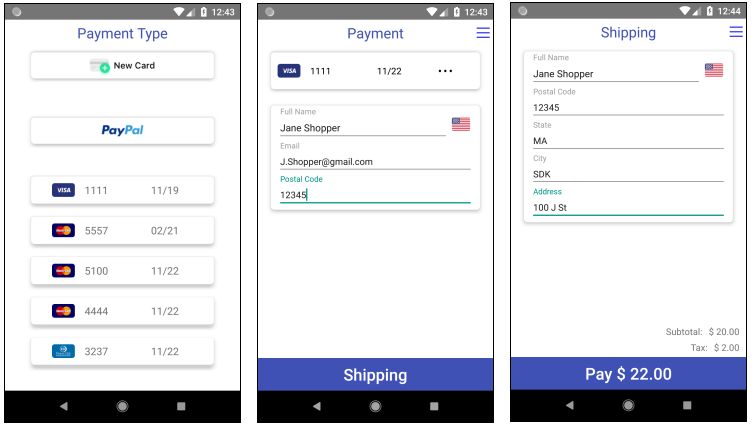 BlueSnap's Android SDK enables you to easily accept credit card, Google Pay™, and PayPal payments directly from your Android app and then process the payments via the Payment API. When you use this library, BlueSnap handles most of the PCI compliance burden for you, as the shopper's payment data is tokenized and sent directly to BlueSnap's servers. The SDK and a demo app are available on GitHub. Refer to the readme file for detailed usage instructions. The SDK includes a checkout form that enables easy collection of the required information for checkout without having to deal with validation of the card number and expiration date, or storage of sensitive information. The SDK and a demo app are available on GitHub. Installation in Android Studio is just a single step. See the readme file for detailed usage instructions. You can use BlueSnap for payments in your Android app for physical products (e.g. clothing), services (e.g. gym memberships), and digital content that is consumed outside of the app itself (e.g. songs that can be played on other music players).